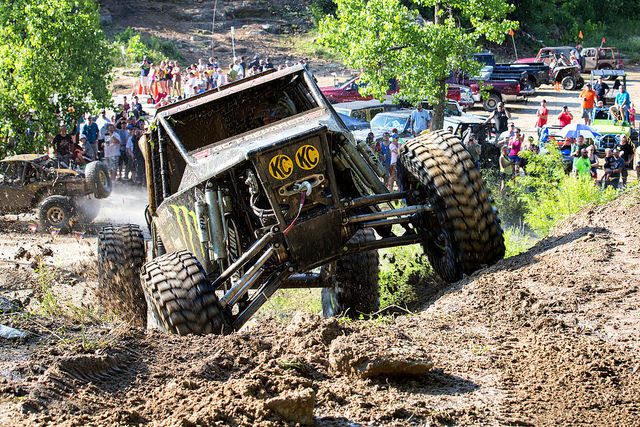 ATTICA, IN – July 3rd, 2014: More than 40 ULTRA4 cars came to compete at The Ultimate Motorsports Championship last weekend at Badlands Off-Road Park in Attica, IN. The race has grown nearly 70% in the last 3 years and has become a true battle of East meets West on some of the harshest terrain the 2014 ULTRA4 season has to offer. The fastest drivers from the East included; Erik Miller, Derek West, Bill Baird and Chicky Barton. Drivers from the west included; Shannon Campbell, Loren Healy, Wayland Campbell and Tom Wayes. After two and a half brutal hours of racing, Shannon Campbell lead by two laps over Mike Colville, making him the ULTRA4 winner at the Badlands for the 2nd year in a row. Drivers were given the option of climbing the final wall in the rock quarry or receiving a 5 minute penalty if they elected to bypass the wall. This added an element of strategy for drivers in a race that is determined by the number of laps completed, and if multiple drivers complete the same number of laps, it is then determined by fastest time to complete those laps. qualifying just 3 hundredths of a second behind him. The main race saw the drivers taking the green flag one car every 10 seconds. Drivers first had to conquer several rain-drenched man-made obstacles in the amphitheater before heading out onto the 5 mile course. From rock walls to sand dunes, to tight, tree-lined straight-aways, Badlands offers terrain that puts the toughest of the ULTRA4 cars to the test. This year’s course was made even more challenging by several torrential downpours on Saturday that cleared up just before the green flag dropped. Shannon Campbell’s strategy was clear from the start. He was going for the most laps possible, taking the 5 minute penalty on almost every lap. This strategy combined with Campbell’s consistently fast laps had him 2 laps ahead of Mike Colville when the checkered flag dropped. Colville’s strategy was the exact opposite of Campbell’s as he only took the bypass twice in his 9 laps, and still managed to finish a lap ahead of the rest of the field. In the end it would be Campbell in first, Colville in 2nd and Healy in 3rd, with only about half the cars still running at the end of the race. At every 2014 ULTRA4 regional race, the top ten drivers who haven’t already qualified earn a spot to compete in the the 2015 Griffin King of The Hammers presented by Nitto Tire. Several of the drivers that qualified at Badlands were competing in their first ever ULTRA4 event. Those drivers are: Dave Fox, Rowdy Trubenbech and the youngest female ever to qualify for KOH, 17 year old, Bailey Campbell, daughter of Badlands winner, Shannon Campbell. The unlimited ULTRA4 class shared the course this year with 5 modified 4500 vehicles. Casey Gilbert, who would have been the only 4600 stock vehicle to compete, opted to race with the 4500s, and ultimately won the field, followed by Jay Callaway and James Cantrell. The 4 Wheel Parts Glen Helen Grand Prix in San Bernardino, CA, is the next ULTRA4 event. It will take place next weekend and is the 2nd race in the Trail-Gear Western Regional Series. The next 4WD Eastern regional event will be the Sturgis Off Road Blowout in Sturgis, KY on September 12th and 13th. The next ULTRA4 Europe event will be the 3rd annual King of The Valleys held in WalesAugust 8th-12th.